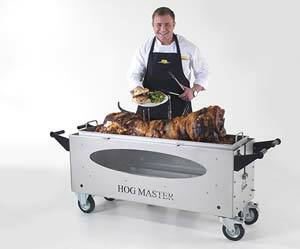 Thinking about hiring a hog roast machine so you can have a barbecue in your back garden, a DIY event in the local park or a corporate lunch at your work premises? You’ve certainly come to the right place! Here at Hog Roast Slough, we rent out the machines that we designed and hand-build ourselves in our own factory, so that you can take control of the party or event that you’re planning. Our top-class equipment does all the hard work while you take all the credit, so you really can look like a pro chef, and what better food to cook for yourself and your guests than an amazing, juicy hog that’s slowly roasted away for hours on end? 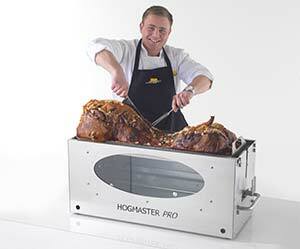 Hog Roast Slough recently took a call from Bryan, who had been recommended to us by a friend. He was thinking of hiring one of our hog roast machines for a personal party, to celebrate retiring from the Civil Service, but also because he was thinking of starting his own part-time business as a hog and spit roast caterer. We often recommend that you try before you buy and in this case, he was more than happy to as he had never roasted a hog before, despite wanting to start a business! Luckily for Byran, however, he could benefit from our years of experience, so we could walk him through everything he needs to know about this kind of a business, how to use the different machines that we rent out and sell and also how to perfectly prepare and cook a hog or spit-roast other meat. 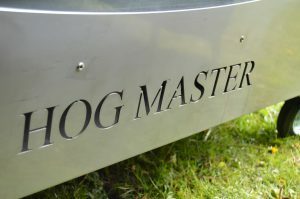 With a Hog Roast Slough machine hire service, a drop-off and collection is included in the price, as well as a gas bottle. I went along to Bryan’s home to teach him the ways of the hog roaster, and I’d brought along a small pig for him to cook, which is an extra service we can provide if you’re not sure where to source your meat. It didn’t take long to teach Bryan various tips and tricks and our machines are so easy to use that he picked that up in no time. When I collected the machine on Sunday, Bryan loved it so much that he was adamant he would be starting his own part-time hog and spit roast business as soon as possible.